Microsoft will soon announce a free version of Windows 8.1 in a bid to persuade customers to upgrade to the latest version. The new version, called ‘Windows 8.1 with Bing’, could be given away at a developers’ conference in April, a version that would have key Microsoft apps and services. One thing definitely good in this new free O/S is atleast they would bring back the start button which can let you boot straight to the desktop..
Windows 8.1 allows for a lot more rationalization across the board. You can now pick from built-in backgrounds that move and animate as you swipe, but there’s also the ability to change the color scheme with a color picker that’s a lot more flexible than Windows 8 ever was. But the real star of the show is the ability to set the desktop wallpaper as the backdrop for the Start Screen. It sounds simple, but it’s an effective way to bridge the otherwise jarring switch from desktop to Start Screen. Perhaps the single biggest change in Windows 8.1 is Microsoft’s approach to search. Where it used to be specific and tailored, it’s now universal. If you search for “Store” in Windows 8.1 it will still show you the app, but now it also reaches out to Bing’s web engine to find results. Search is now a separate app gathering documents and data stored locally or in SkyDrive, system settings, and even web results all in a single interface. If you’re an existing Windows 8 user then moving to 8.1 should be relatively pain free. 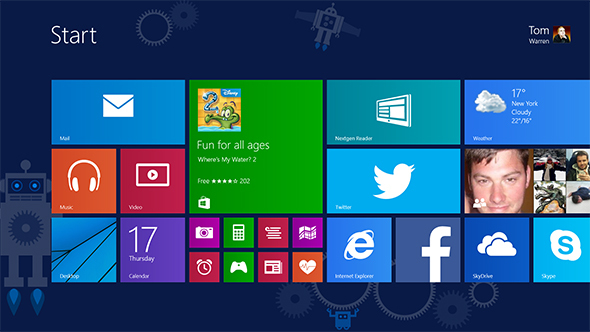 The update will retain all desktop and Windows 8-style apps, including files and settings. It’s worth backing up just in case, but it should be like any other patch through Windows Update that Microsoft supplies on a monthly basis. Windows 8.1 Preview users will have a slightly different experience depending on how the Preview was originally installed. If you installed Windows 8.1 Preview from the Windows Store on top of Windows 8 then you can move straight to the final edition in the Store today. Personal files will be retained, but apps will need to be re-installed. Microsoft ties together its visual changes and features with a new set of built-in app improvements, centered more than ever around SkyDrive. Microsoft’s cloud-based storage system really powers Windows 8.1 this time around. The sync engine is built directly in, and Microsoft has made some smart improvements to the way that files sync to Windows 8.1 PCs. Instead of pulling down the entire SkyDrive storage to a local PC, it loads icons, and just enough information required to identify the file. When you open the file, it downloads it on the spot. You can set folders and files to download fully so they’re available offline, or just set an entire SkyDrive instance to remain offline on the PC. The built-in apps for Windows 8 felt rushed and lacking in features, but Microsoft has really improved every single one with Windows 8.1 and there are even a few new ones to speak of. Each app has been visually refreshed, and some even have a Windows Phone-like app bar to improve navigation. The Mail app has been completely redesigned, improved for both touch or keyboard and mouse use. You can drag and drop messages into folders, easily select multiple messages with checkboxes, and generally filter out and manage email a lot more easily. Performance has also greatly improved, with draft emails simply appearing on the right-hand side rather than taking up the full screen. Outlook.com users naturally get the best experience Microsoft has added in support for favorites, a flagged emails section, and separate filters for newsletters and social emails. Microsoft has also added in the new window option for Mail in 8.1, allowing you to snap messages side by side. Coupled with the new Calendar app, which comes with a redesign and new “what’s next” view, improvements to the People app, and some keyboard improvements for quick number entry, the built-in Mail experience is light-years ahead of what was available in Windows 8. 1) At Number 1 Spot “Adobe Reader”: Were you guys thinking it should start with some Microsoft application ;). So here we go Adobe Inc’s popular software Adobe Reader is the most hacked software of this year. Security firm’s reportedly tracked as many as 45 bugs in the Adobe Reader programme this year. The number is up from 14 in 2008 and seven in 2007. Security experts feel that Reader being a universally used programme makes it highly vulnerable. Also, its complex code base offers a high risk of flaws. 2) Internet Explorer: Ok, we have Microsoft in gates now, At No. 2 on the Most Hacked Software list is Microsoft’s Internet Explorer. Little surprising that the browser with majority marketshare (almost 65%) is hot on hackers and scammers target list. According to the news report, IE’s complex code base with no shortage of bugs helps hackers. Security researchers found 30 bugs in IE this year, almost the same number as last year and way down from 49 found in 2007. 3) Mozilla Firefox: Now I come to know why Google wants to mess up in this browser war’s, The open source browser Mozilla Firefox is the year 2009’s third Most Hacked Software. Closest rival to Internet Explorer with approximately 25% marketshare, recorded an increase in vulnerabilities this year. Researchers and cybercriminals found as many as 102 bugs in Firefox this year, an increase of 12 bugs vi-a-vis last year’s 90 bugs. Wondering what makes its more vulnerable than IE which showed 30 bugs? Remember, the two cannot be compared directly as Firefox is an open-source programme and Mozilla publicly reveals all its bug finds. 4) Adobe Flash: What is happening to Adobe to much money or lot of dumb asses, At No. 4 on the Most Hacked Software list is Adobe’s popular design software Flash, commonly used for viewing animations and movies. The report found 11 vulnerabilities in the programme this year, down 8 from 19 last year. According to the report, the vulnerabilities pose a potential danger as the software used for viewing videos and animation requires no interaction with the user to infect the machine with malicious software. 5) Apple Quicktime: Now let’s turn our back for Apple, because next on the hit-list of hackers is Apple Quicktime, a multimedia framework used for handling various formats of digital video, media clips, sound, text, animation and music. Though Apple talks about immunity from bugs in its machines, however, security experts feel that relative security comes from its low marketshare and not careful coding. According to the report, 26 bugs were found in Quicktime in 2009, down 10 from 36 found in 2008. The number looks high compared to mere 3 found in Windows Media Player. 7) Windows: I think I myself going to boredom, so let me end this list by what we wipe our eyes everyday with, offcourse Windows Sir, at no. 7. Microsoft Windows-based operating system continue to be top on hackers radar. Experts believe that the fact that Windows vulnerabilities can be exploited without a user actually doing anything makes the software hacker-prone. For example the Conficker worm spread to over 7 million PCs last year without requiring a user to visit a website, or open an attachment or actually do anything else, other than just leave their computers running. Let me conclude this way this companies are the IT big wigs and money is no matter for them, my advise instead of marketing your apps with some dumb asses and with the world turning for software applications day in and out, think of investing the same in atleast securing your asses for it. For we users we need to continue with this mess much longer. stability and security is a long way to go in software yet.. Some of the Best Password Manager ? LastPass Password Manager – LastPass can manage all of your passwords, generate new ones, fill in forms and more. Also works with Internet Explorer(). RoboForm – Memorizes your passwords to log you in automatically, can generate new passwords, encrypts what is stored and more. Secure Login – Gives you easy access to your passwords, the ability to make secure bookmarks that will log you in, keyboard shortcuts and a lot more. Sxipper – Sxipper allows you to create personas that will fill in all of your information by just clicking on them. Can be used to sign up or log in to sites. 1Password for Mac – 1Password takes care of all your online passwords so you can use strong and unique passwords for every site and never forget any of them! with features covering all aspects of storing and using sensitive information. I myself have Roboform and Keepass and a variety of vaults, but Lastpass seems really interesting to me as an Opera/Chrome in preference to FF/ie user. Best Smartphone by Operating System used..
With its BlackBerry Bold, RIM showed us the way forward, while the touch-screen Storm changed the BlackBerry game entirely. But T-Mobile’s BlackBerry Curve 8900 is the best of both worlds. The 8900 packs a higher-resolution screen, an updated user interface, a faster processor, and integrated document editing. It also features the svelte form factor that’s a dead ringer for the small, sleek, and wildly popular Curve 8300 series. Our only complaint: No 3G radio. But free calls over Wi-Fi help soften the blow. Defnitely I say this is a true Champ 8) yeah!! Windows Mobile runs on so many handsets that it wouldn’t be fair or accurate to pick just one. Try using the HTC Touch Pro apart from Palm, a powerful, high-end slider with a five-row keyboard, full VGA (640-by-480-pixel) resolution, a touch screen, and a full complement of radios—though all these features are offset by an unintuitive interface. Palm scores big with its unlocked Treo Pro, a shrewdly specified enterprise Windows Mobile-based smartphone, even if the lack of a subsidized, carrier-backed version keeps mainstream users away. This OS, though very new, already has a cult following among programmers eager to develop apps for its flexible, Open Source, back end. Android, which was developed by Google, has yet to own even a small part of the smartphone market because of its recent release date. Android is an Open Source, Linux-derived platform backed by Google, along with major hardware and software developers (such as Intel, HTC, ARM, and eBay, to name a few), that form the Open Handset Alliance. Not so bad the try with its feature, never used it though..
Linux is strongest in China where it is used by Motorola , and in Japan, used by DoCoMo. Rather than being a platform in its own right, Linux is used as a basis for a number of different platforms developed by several vendors, including Google’s Android, LiMo, and TrollTech, which are mostly incompatible. Another platform based on Linux is being developed by Motorola, NEC, NTT DoCoMo, Panasonic, Samsung, and Vodafone, as I remember. So there we go ending another post as usual with some glitter.. I have also setup a poll to rate the O.S from your your view..